After having played in the USCL from 2005 through 2009, I skipped the 2010 season and I wasn’t particularly certain about playing this year. But with my office moving to just a couple blocks away from the Mechanics Institute and one of the regular SF GMs moving away (Josh Friedel moved to Wisconsin, opening up an extra spot), I decided to give it a go. 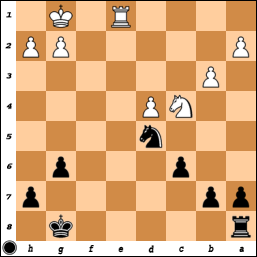 My first game back was going to be as black against GM Melik Khachiyan. I was pretty nervous before the game. I had played a handful of blitz games on ICC since August 2010 and no slow games, and I never executed on my grand plans to study before the USCL season. It’s one thing when you’re playing individually, but here, in addition to not wanting to embarrass myself, I didn’t want the team to lose because I missed a mate in 1. I had expected an Exchange Ruy Lopez, but I guess Melik wanted to change things up from our last (in-person) game. Instead, he went with the Giuoco Pianissimo, and while I had some trouble recalling all the correct move orders, I did get to a position I recognized at this point. During the game, I actually thought this was how my game against Vocaturo last summer went, but it was only a marginally different move order and position. We could have transposed to that after 12.Be3 Bxb3 13.Qxb3 Qd7. “Beware the knight, my son! Before continuing with my Greatest Hits, I’ll take a little detour into Greatest Flops. 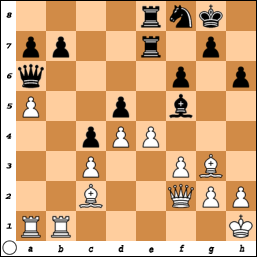 The above position was reached in my game against GM Bu Xiangzhi (he had the white pieces), at the first US-China Chess Summit match in 2001. The match was a 4-round team event, with a men’s team, a women’s team, and a junior team. I was on Board 1 for the junior team, with Dmitry Schneider on Board 2 and Hikaru Nakamura as the reserve. The Chinese junior team had Bu on Board 1 (already a 2560 GM at the age of 16 – a great achievement now, an even bigger deal back then), with Ni Hua on Board 2 and Wang Yue as the reserve. This was the first game of the match, and so far, things had gone quite well for me. I had neutralized Bu’s opening quite easily and reached the pretty equal endgame above. 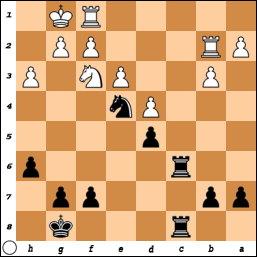 If Black now plays the simple 24…Rd8 (if 25.Na5, 25…Rb8 is enough), he has no real troubles. 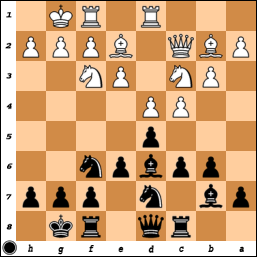 With the powerful knight on d5 and the rook on the 8th rank, White can never make any real headway, and if he takes his pieces offsides, then Black might bring his king up without worrying about any annoying knight forks. It also makes complete sense to bring the rook into the game. Unfortunately, I completely lost my head and proceeded to play the endgame like a child. With some free time this weekend, I was looking at the list of live games on the TWIC site and noticed this gem from the Bundesliga. It’s a game between GM Chuchelov (2565) and GM Shirov (2749). Of course Shirov is the favorite in such a matchup, but this game was still very impressive I thought. This is a topical position from the Anti-Meran variations of the Semi-Slav. In fact, I’m pretty sure I had this position a few times over my Fellowship years. Unlike Shirov, though, I was hesitant to open the center up with my queen still on d8 and so I think I would play 11…Qe7 here. The Melody Amber rapid/blindfold tournament is underway in Monaco, and it’s a pretty stacked field: 11 of the top 15 in the world, plus Anish Giri (no scrub himself), are playing. So far Aronian has proved to be the most slippery player, escaping from worse/lost positions in all 4 of his games to score 3.5 points! The move made some sense – Black has to do something about White’s slowly advancing center, and …Bf5 forces a decision with the e-pawn. I didn’t have much time to think about what was going on when Grischuk played 39.exf5!!. But wait, didn’t Kramnik stop that with the threat of …Re2? I wrote in my last blog entry that while guessing Morphy games, I also spent some time learning simple (in terms of the number of pieces) endgames, like king and pawn endgames and minor piece endgames. 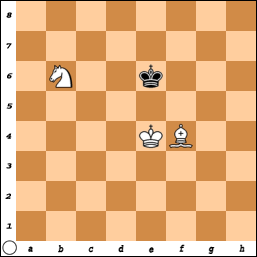 I only have had the bishop-and-knight mate once (never on the defending side), but it came just after I turned 7 years old! 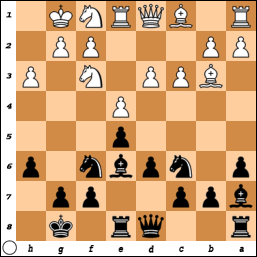 Amusingly, as that was one of the checkmates that Richard Shorman had taught me, I had some sense of what to do. I was white against Edmund Rendler, both of us probably around 1100-rated players (my first USCF rating was 1000), and it was played at the Koltanowski (Kolty) Chess Club in Campbell, CA on July 18, 1991. Actually, there was no reason for it to even get here. I had won a couple pieces in the middlegame, but instead of exchanging all the pieces and leaving just my extra material and pawns, I traded all the extra material and pawns, leaving myself with just the bishop and knight. Happy new year to everybody, and best wishes for 2011. Anyways, this post is partly the result of some recent reading. On the recommendation of two friends, I just finished Josh Waitzkin’s 2007 book The Art of Learning on my way to/from work. Like him, I started learning chess “backwards” in a way, starting mostly with the endgame. If I remember correctly, the first book I read was called Every Great Chessplayer Was Once a Beginner, but that mostly introduces how the pieces move and so on. After that, while guessing at Morphy and Anderssen games, I spent a lot of time on basic endgame patterns (in king and pawn and minor piece endgames). The opening was a bit of an afterthought and so all sorts of unsound gambits were featured in my games. Most of my scholastic opponents were especially weak compared to me in the endgame, and so it’s no huge surprise that I would routinely win pawn-down endgames like this one, especially as it isn’t all that easy for White to convert his advantage in this endgame (White was an 1800-rated player, I was 2150 or so).